For people in parts of Darling Downs and Granite Belt and Southeast Coast Forecast Districts. Issued at 8:04 pm Saturday, 9 February 2019. 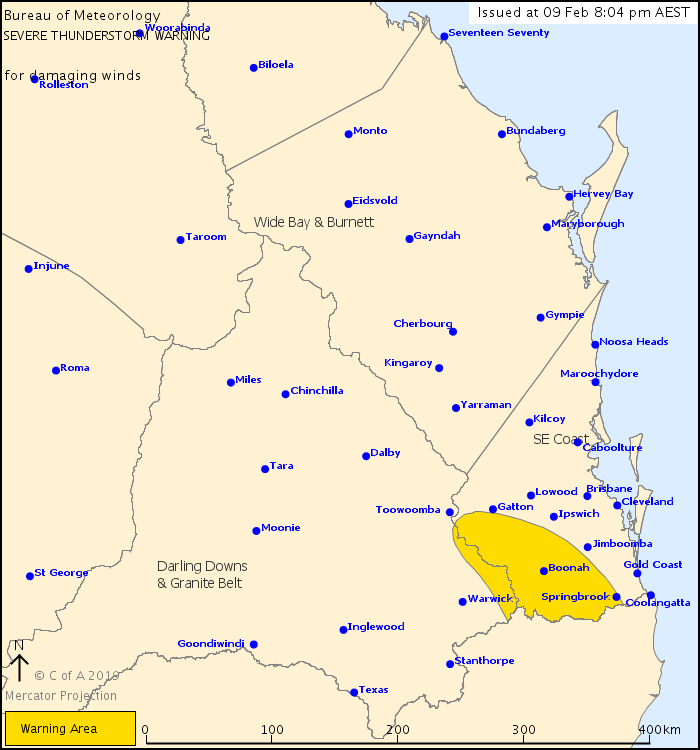 Damaging wind gusts possible across southeast Queensland. Weather Situation:An intensifying squall line is currently moving into the Southeast Coast district. Although there are no indications of severity, it may, however produce an isolated damaging wind gust. Severe thunderstorms are likely to produce damaging winds in the warning area over the next several hours. Locations which may be affected include Boonah, Beaudesert, Laidley and Springbrook.